Home Marsupials Agile Wallaby Bennett's Wallaby Brushtailed Possum Common Wombat Eastern Grey Kangaroo Eastern Quoll Euro Koala Red Kangaroo Rock Wallaby Swamp Wallaby Tasmanian Bettong Tasmanian Devil Tasmanian Pademelon Thylacine Books about marsupials Have you ever seen a bettong? 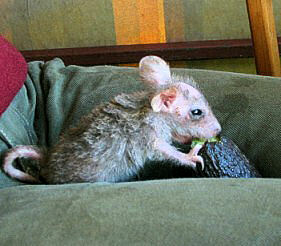 The first one I ever came across is Lydia, belonging to Bettongia gaimardi. She lives in Tasmania and her first mummy died in a car accident. Suzy found her dead body, took Lydia out of the cold pouch and raised her under her shirts from then. Lydia was still young when I made this video, quick bouncing across the carpet was still easier than standing still upright for a while. So she'll live in her quiet unusual pouch for another while, until she's a big handsome bettong and bounces off into the forrests of Tassie. Hopefully she'll always avoid streets and cars in the darkness. I made some short videos of Suzy and Lydia with my digicam, you may download them, if you wish.